I’m 2-0 against Chick Fil A! The USPTO has finally granted me a TRADEMARK for EAT MORE KALE, despite Chick Fil A’s disruptions. I’ve also called Chick Fil A’s bluff on their insistence that I “cease and desist”. It’s been a long 3 years battle, but it’s been a GREAT WEEK!!! Jeff Danziger is an amazing cartoonist and one smart cookie. I recently stumbled across his “take” on KALE MANIA. 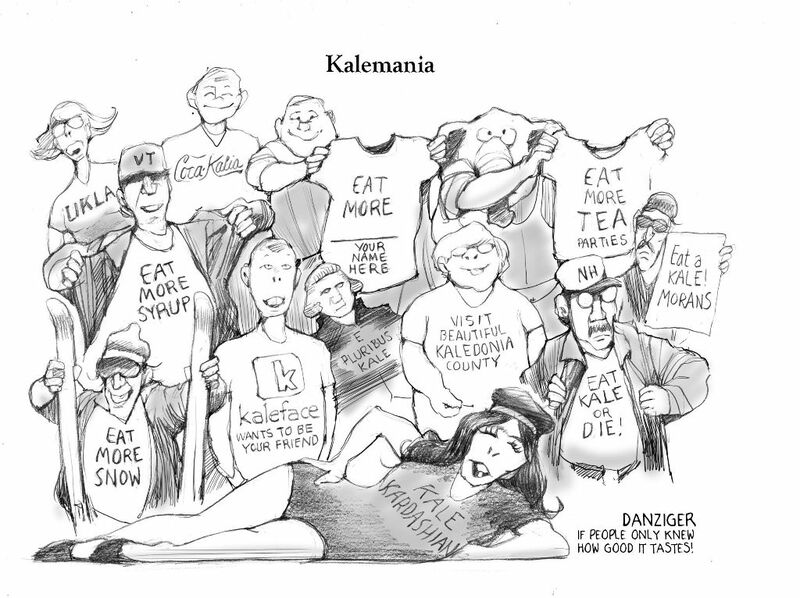 That is…Kale, Kale News and Kale t-shirts are HOT these days. What a hoot. 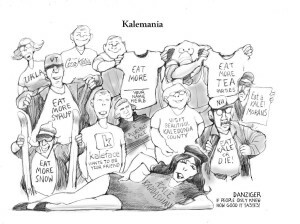 Who’d a thought 12 years ago that when I started printing EAT MORE KALE t-shirts that they’d somehow be parodied NATIONALLY in 100’s of newspapers? Even my Grandma saw it in her local paper in Alabama! I’ve been told that Jeff Danziger is from Vermont. He now lives in New York. I’m honored to be on his radar. EAT MORE KALE has lead me to a load of fun. That’s for sure.